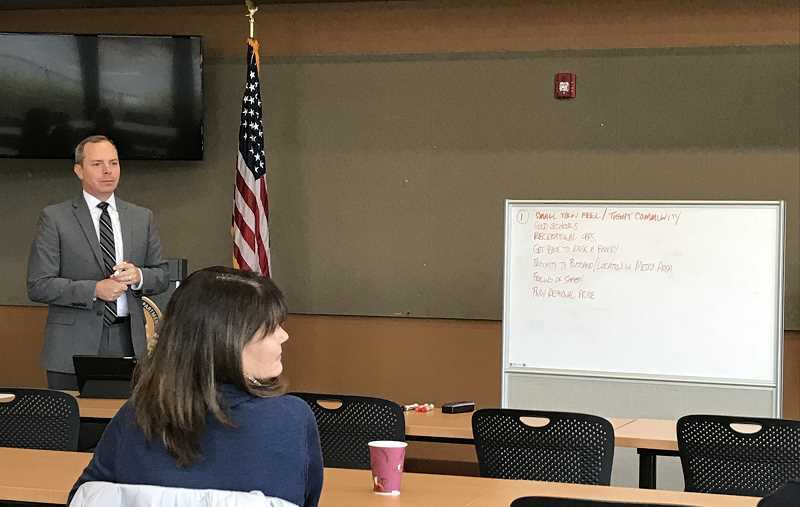 Representatives from a number of community groups and organizations were invited to the West Linn Police Station Jan. 4 for a forum on the selection of West Linn's next police chief. The meeting was led by Greg Nelson, a senior consultant at the Sacramento-based Ralph Anderson & Associates firm that was hired by the City to handle the search for a new chief. A former police chief himself, Nelson said he now handles the recruitment process for leadership roles ranging from city managers to police and fire chiefs, public works directors and various other municipal positions. But after 20 years working at a police department for a city of about 34,000 in the Midwest, Nelson said he is most in his element when a police chief search comes about. Nelson's firm was hired following the controversial departure of longtime West Linn Police Chief Terry Timeus, who retired last October at the conclusion of an investigation of allegations that he drove under the influence of alcohol. No charges were filed. "I really particularly enjoy chief recruitments, and I've done nine in the last three years for cities smaller than West Linn and for cities much larger than West Linn," Nelson said. And while there are some general traits to look for in any leadership position, Nelson said it is important for him to approach each search with an open mind. "I very much believe each of these is a very different recruitment, looking for a very different type of candidate for each community," he said. "A lot of times I'll come to these meetings and people will ask, 'Do you have some candidates in mind already?' And I'll say, 'No, I can't, because I have no idea what you want.'" The hope was that would no longer be the case by the conclusion of the meeting. To that end, after breaking down the search process — which is expected to last about 90 days, with the chief's likely start date in June — Nelson asked several big picture questions to the handful of residents in attendance and listed the answers on a whiteboard. Among the groups and organizations represented at the meeting were the Community Living Above group, the Willamette Christian Church, the West Linn Lutheran Church, the Emmanuel Presbyterian Church of West Linn and the Willamette United Methodist Church. The first question was simple: what are the traits that make West Linn a good place to live? Residents noted everything from a small town feel — "There's one degree of separation between you and everyone in town" — to high-performing schools, ample recreation opportunities, safety and a spirit of generosity. Asked about specific challenges the WLPD will face in upcoming years, residents cited a possible uptick in crime as urban growth boundaries expand, as well as increases in cybercrime, connecting with the community and recruiting and retaining officers within the force. Several residents also agreed that a "toxic city government environment" could be an issue, while Pam Pearce of the Community Living Above group brought up the prescription drug crisis that has enveloped the country in recent years. "The West Coast hasn't seen the devastation that the East Coast and Midwest have, but we have had cases of fentanyl (an opioid) here in West Linn, and that's just going to take off," Pearce said. "(We need) a police chief who understands substance abuse disorder (and) understands it's not a criminal act." Pivoting off of that, Nelson asked what specific changes residents would like to see from the WLPD under new leadership. The answers, predictably, were mixed. Resident Jules Walters said she hoped to see the addition of more officers to the force, which currently carries 25 sworn officers, while adding "I would like to see the chief be more of a leader than just a manager." Another resident, retired Portland Police officer Adam Levin, agreed that the force should grow. "Currently, the public is outgrowing the resources this agency has," Levin said. "(The police station) is a lovely new building and great, but I'd love to see more officers out on the road. I'd like to see more community policing and resources available." Pearce, for her part, suggested that the new chief should foster more dialogue between officers and management. "I would want the police chief to come into this environment and be able to have kind of an open and safe environment for the current police officers, so they can say, 'This is what I see,'" Pearce said. Levin added that Tualatin's recent transition to a new police chief in 2016 should be seen as an example for West Linn to follow. "I hear from Tualatin that if two cars are out and there's one car available, their chief jumps in a car and becomes an extra person," Levin said. "That's amazing, because you don't see it a lot. (Being) willing to walk the walk and talk the talk is big for the officers and amazing for the community to see." Finally, residents brainstormed specific traits they hoped to see in the new chief. They said the new chief should be "collaborative" and "adaptable" while also working to promote diversity and holding staff accountable.